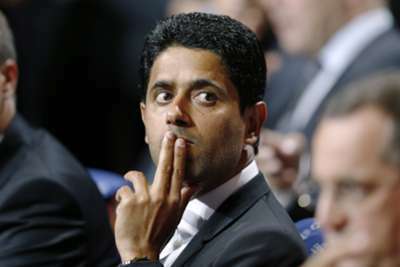 Paris Saint-Germain president Nasser Al-Khelaifi is confident that his side can progress to the UEFA Champions League knockout stages. The reigning French champions have been drawn in Group F alongside Barcelona, Ajax and Cypriot side APOEL. PSG looked set to make the semi-finals last season following a 3-1 quarter-final first-leg win over Chelsea, but a 2-0 defeat at Stamford Bridge turned the tie around. Despite the setback, Al-Khelaifi is cautiously optimistic that his side can navigate what is a difficult group. “We are also a great club this season I think. I respect Barcelona a lot obviously. That’s a great club, they’ve won it four times,” he said after the draw in Monaco. “Do not forget Ajax, they’ve won it four times. We respect them as a football club. We will try to win all our games and get the three points, always. In an interesting twist, PSG’s draw will see star striker Zlatan Ibrahimovic line up against two of his former clubs, Barcelona and Ajax. The Sweden captain is much revered at the Parc de Princes and Al-Khelaifi admits he is looking forward to watching him face his previous employers. “It’s going to be two special games for Zlatan against Barca and Ajax,” he said.